You may have some senstive files in your PC or a potable USB device, Advanced Folder Encryption is good encryption software which will take less a minute to lock your files/folder. You can handle it with no difficulty even if you are a computer novice. Advanced Folder Encryption is easily accessed and designed to password protect your personal and confidential files. With its powerful function one can manage the right of hiding, copy, remove, shreding a file/folder. If this is your first time usage you have to dowload the setup exe in the site Advaned Folder Encryption, and then open the file and finish the installation. 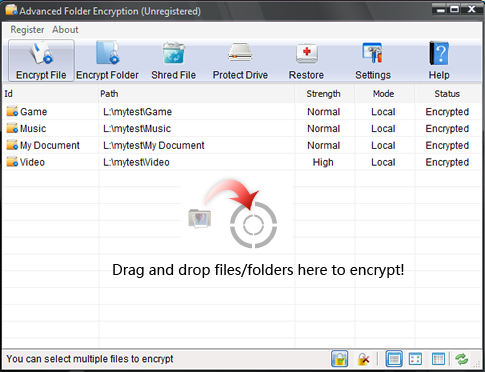 Advanced Folder Encryption is multi-functional data encryption software, aparting from password protecting your folders it can also lock your portable USB disk security in your PC. It realizes the utility of data locking as well as disk encryption. With its on-move function you will not worry about your inportant files and documents whenever and wherever you are.